There is something special about communication that's in writing as opposed to oral. It is permanent, you can craft it more carefully than talking, and it takes more effort. Additionally, I'm guessing it happens in a different part of our brain and thus people will express things in writing that they wouldn't, orally. Online discussions have the additional characteristics that they are searchable and in this case, once they are out there, you can't take them back... It behooves people to be thoughtful about what they say. These characteristics make an online discussion beneficial for a developing community of novice scientists. It´s important to... speak loud and clear. It´s important to... give details and evidence. It´s important to... respond in a respectful manner. Everything up to this point was done in a whole-group setting, and I was stretching their attention (mom and dad used to say, "No souls are saved after 20 minutes"--a small town preacher's saying). So, how do I make it so that everyone can simultaneously jump in and discuss, in writing, this topic of shared values? Step in the Computer-enabled science classroom! Students logged into their account, opened Firefox and went to our class website, managed on a CMS, Plone. I had prepared a page to scaffold this next step. Since plone doesn't allow for simultaneous editing of a web page (and I don't think my students would succeed doing that, yet), I instead used plone's commenting feature. 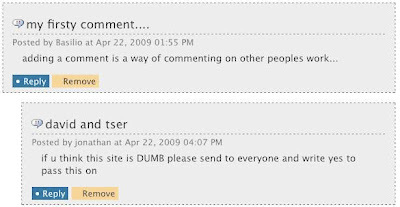 I had students either add a comment to the (bottom of the) page, or reply to someone else's comment. So I opened things up, and got some important (and predictable--I've been teaching for 20 years :) stuff. Below is a screen shot of the first comment that was made in 1st period, along with a response made to it by Jonathon from 2nd period. The first comment by Basilio was a practice comment to make sure posting worked. The reply to the first comment was actually done during 2nd period, in other words, it was done after all (about 20) posts had been made during period 1. This provided me with an opening so I then turned to the rest of the class and asked them if they felt it was important to be able to question or challenge what other people are saying. There was widespread agreement with that. The class finally chose this wording for this class value: "Disagree with someone when you think he or she is wrong." A person at table 1 wrote that value, recording it for our class. Then, I asked if there was anything that people didn't like about this post. Marlon said he didn't think it was very respectful, and a few people agreed with that. So I asked, "So what are you saying is our value?" There was some back-and-forth between several members of the class, and DeAndrew succinctly said, "Disagree in a polite way and have reasons proving your disagreement." A volunteer at table 2 wrote that down as our second value. With this process, together we are starting to codify a set of values for our scientific community. I only did a few, not wanting to spend too much time on this. Much remains including further filling out this list which is now posted on line for each class, improving the clarity of the listed value and its presentation, and of course the big one of developing and 'privileging' these values in our community. This process needs to be done in the context of our class performing scientific inquiry. The nice thing about online discussions is that we can always analyzie and reflect on what was said. As always reader (s?) comments are welcome.